Glass Splashbacks for Kitchens or Glass Splashbacks for Bathrooms? Would you like glass splashbacks for your kitchen? Glass Splashbacks for Kitchens - Coloured kitchen glass splashbacks are justifiably amongst the most attractive recent elements to be applied to modern kitchen design. As glass is highly reflective it introduces light into the darkest of kitchens and gives a sheen hard to achieve from anything other than the most glossy surfaces. Couple with that the fact that coloured glass splashbacks are indeed kitchen splashbacks with a rich and vibrant colour (such as the lovely fuchsia one to the right) and that the choice of colours is practically limitless, you are left with a splashback choice which can't be beaten!! If you would like learn more about the world of the wonderful glass splashback please either click the image to the right or the image below or the glass splashbacks for kitchens title at the start of this or simply click here. 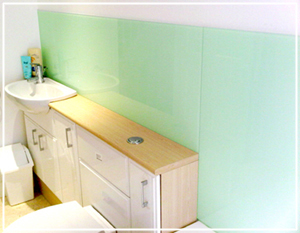 Or do you want glass splashbacks in your bathroom? Glass Splashbacks for Bathrooms - As we've already stated above, glass splashbacks in bathrooms are no different to glass splashbacks for kitchens. They are still fabricated in exactly the same manner and the installation procedure is no different. However, where they do come into their own is when you start to apply them to the inside of your shower, like in the beautiful shower to the left where the colour was stone (see our colour chart and click on the colour stone for more pics of this colour) or behind your sink, like the image below right (once again view the colour chart, this job was peppermint). 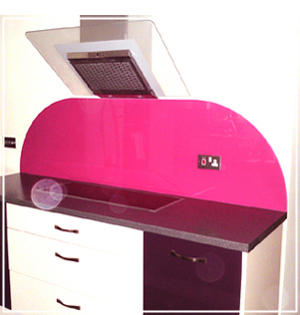 beauty and coloured glass splashbacks can more than help you achieve such designs. 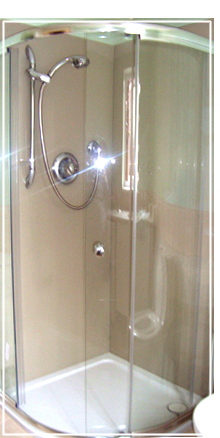 Also they are hugely practical in bathrooms as you can say bye to 'dirt trap' grout lines associated with tiles. As before click the images to the left and right or click on the 'glass splashbacks for bathrooms' title or click here.